The first thing to get out of the way, is the question that I am most frequently asked on this subject. Can ladies wear a kilt? If you listen to the traditionalists, and there are many of them, they will tell you that only men may wear the kilt. Indeed if you bother to look for the definition of "kilt" in your dictionary, you will find that it defines a kilt as a pleated skirt, usually made of tartan cloth, worn as part of male dress in the Scottish Highlands. That is the traditional definition, and as I said, many traditionalists would have you believe that women have no right to wear a kilt. Why shouldn't a woman wear a kilt if she wants to? After all a kilt is an item of clothing, and there are no laws prohibiting ladies wearing kilts (despite what the traditionalists would have you believe). Indeed when you surf the net, you will find that almost every kilt maker these days is offering a wide range of kilts for ladies. These include ladies evening kilts, mostly worn at formal occasions, ladies tartan kilts for day wear, and ladies mini kilts. Below is a photo of a young lady wearing a mini kilt in the black watch tartan. This photo shows the beautiful young lady standing beside a bed which was often slept in by none other than Robert Burns, Scotland's National Bard. Being something of a ladies man, he would no doubt have approved of this young lady in her kilt. But are they really kilts? Well no, they are tartan skirts. Several things, firstly a man's kilt has eight yards of material, over six yards of it is taken up in the pleats. 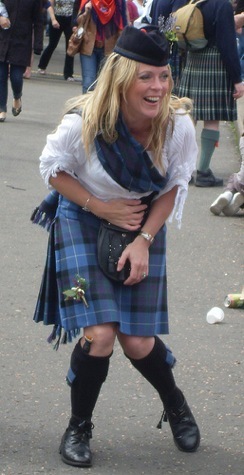 A ladies kilt has less material, and fewer pleats. The top apron of a man's kilt fastens on the right hand side, a ladies fastens on the left hand side. The weight of the cloth in a man's kilt is usually 16 oz, (as is mine) but can be heavier, whereas a ladies has a maximum of 13 oz. The only occasion that I know of where ladies wear men's traditional kilts, are when they join a pipe band, they then wear the same kilt uniform as the men. Below you can see a wonderful example of what I mean. The beautiful lady in the kilt is Louise Marshall Millington, one of Scotland's finest lady pipers. So ladies, if you are looking for a stunning outfit to compliment your partners Highland Dress, look no further than a ladies kilt, in a tartan to match his. If you would like any further information, or help finding a kilt, or any other kilt accessory, please drop me a line using the Contact Us page, I am always happy to hear from you.